For those of you with an iPhone this is a very cool app! I often find myself out at a restaurant or reading labels in the supermarket faced with the dilemma of whether all the ingredients listed are gluten free (and never seem to be carrying The Coeliac Society’s ingredient list booklet). Up until now, I used to Google the ingredient and read up on it to see if in face it was gluten free. 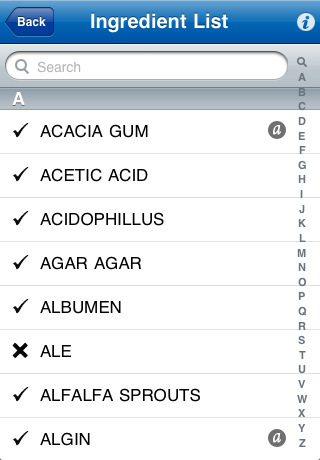 Now thanks to The Coeliac Society of Australia’s new ingredient list app all I have to do is go into the app, search for the ingredient and see if it has a tick or cross next to it. I don’t usually buy apps (just download the free ones!) but this seemed too good to miss out on. At only $9.99 it is definitely worth purchasing, not only to get rid of the hassle of finding out whether an ingredient is gluten free, but also so you don’t have to deal with the side effects of eating something you thought was gluten free but was not!